KUALA LUMPUR (Oct 27): CBRE | WTW viewed the government’s move of not reintroducing the developer interest bearing scheme (DIBS) and maintaining the current real property gains tax (RPGT) rate in Budget 2018 as positive. “CBRE | WTW views positively that the government did not reintroduce DIBS and maintained the current RPGT rates thereby continuing to curb speculative activities,” said director Heng Kiang Hai in a press statement today. 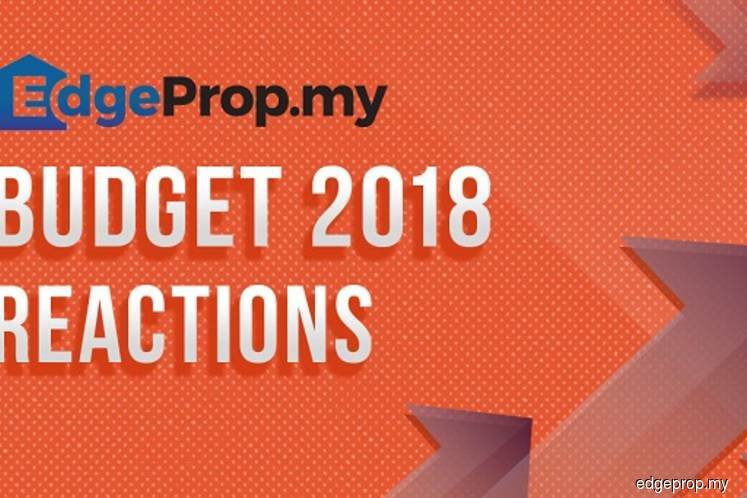 He described the Budget 2018 as one that “aims at empowering the rakyat, driving economic growth and promoting sustainable socio-economic developments simultaneously”. Heng said the step-up financing scheme, which was extended from PR1MA homes to private developers, subject to a set of criteria, would ease availability of credit and therefore improve sales, as well as benefit home buyers as they would service a reduced loan repayment in the first five years of their purchase. “Home ownership hence, may be boosted as buyers’ upfront financial commitment is lower and they have longer time period to build-up their financial capacity. However, more details may be required before such a scheme can be implemented with private developers,” he added. He also believed that the goods and services tax (GST) exemption on property management of stratified properties that is extended to private developers from Jan 1, 2018 will benefit the medium 40% population (M40) as many of them occupy stratified properties. Besides that, the government also announced that 2,000 units of houses have been added to the MyDeposit and MyHome programmes. Under the MyDeposit programme, first time homebuyers are entitled to apply for funding from Urban Wellbeing, Housing and Local Government Ministry to cover the 10% or RM30,000 of down-payment for home purchase, whichever is lower. “Incentives in the form of RM30,000 per sold unit of affordable housing under MyHome scheme will encourage private developers to join in the provision of affordable housing,” he said. On the partial waiver on rental income of up to RM2,000 per month, Heng said it will spur investments as the top 20% household income group (T20) investors will see better rental yields from residential property investments. “As monthly rentals of RM2,000 are applicable to properties up to RM1 million, this is timely to stimulate renewed demand for such residential properties especially in the Klang Valley. On the other hand, the M40 income group would have more rental options as more rental properties enter the market,” he explained.